There are some things that simply cannot be improved upon- so far as I’m concerned anyway. Buttermilk pancakes drowning in syrup for breakfast (and lunch….and dinner if desired). There’s no improving on that. Ella Fitzgerald playing in my kitchen on an early, sunny morning like this one. Top that if you can (you won’t, trust me). The Jenifer Ehle & Colin Firth Pride and Prejudice movie. Perfection itself. Days off work, Coldstone ice cream, the entire Christmas season, classic musicals, the book Forever Amber, my baby niece’s smile- these are all things that I’m convinced cannot be improved because they’ve simply reached that level of perfection that can’t be topped or duplicated. And now I think I’m starting to sound like Maria von Trapp listing off my favorite things, so yeah… moving on. 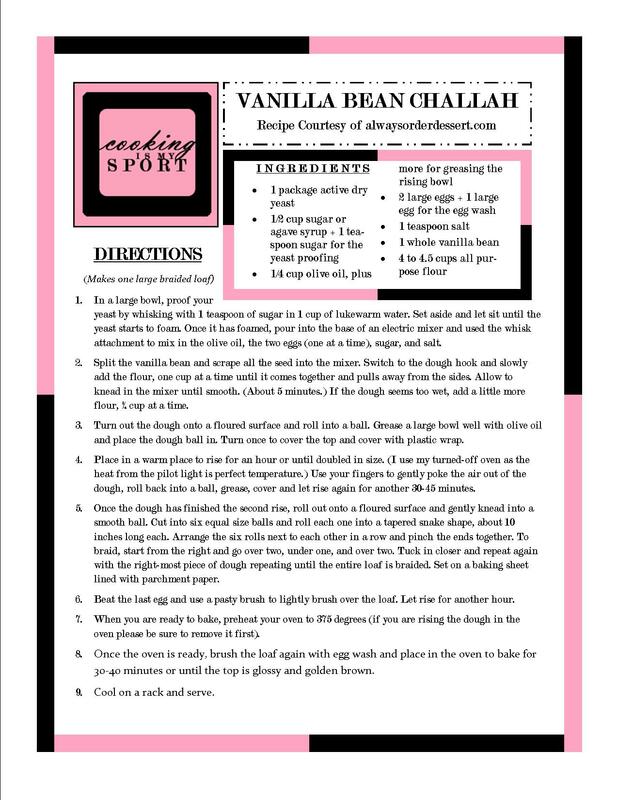 All of these questions ultimately led to me making another Challah recipe, this time more sweeter and with the addition of Vanilla. Why I decided to make another six braid loaf of Challah when I already had two others sitting in my kitchen is a mystery even to me. Don’t worry though: none of it went to waste. Tomorrow’s recipe will prove it. 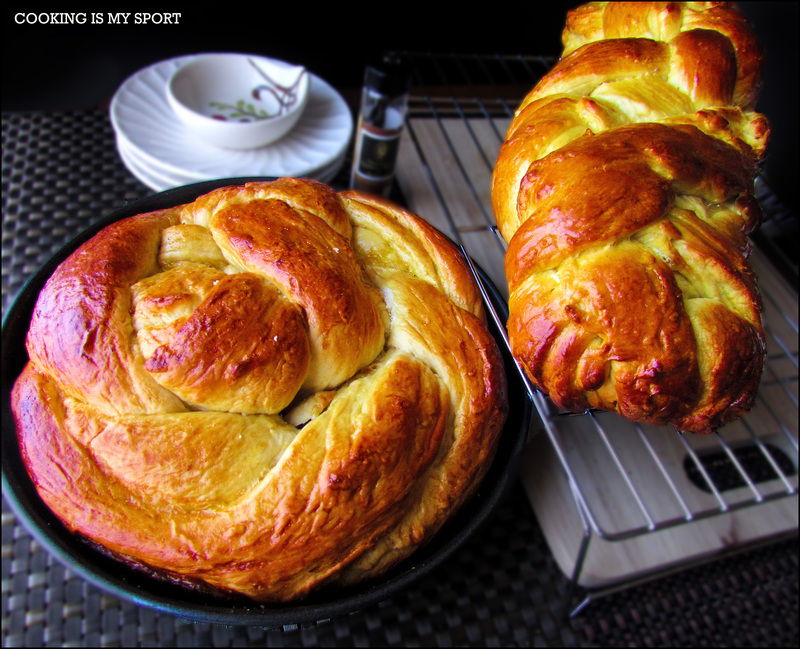 Traditional Challah on the left, Vanilla Bean Challah on the right; which one do you guys think is prettier? So I know that I had mentioned before in one of my previous posts that I’m kinda sorta maybe a cheap skate when it comes to buying what Ina Garten calls “good ingredients”. No shame in my game, guys. I’m the kind of cook that is willing to make due with the generic non-name brand products in the grocery store. I hunt for deals 95% of the time and pass on the full prices…mostly. Depending on my mood and my desire to try a particular recipe, there are occasions where I’m willing to bite the bullet and buy the pricier ingredients. This was one of those cases. I just couldn’t see a way around it; I had to use the real thing. So I went ahead and bought a vial containing 2 vanilla beans. I even included it in the pictures in case you guys didn’t believe me. So let’s give a cheer for Jess…and for her wallet. Turns out, challah IS one of those things that can be improved upon. Because this stuff is friggin fantastic. I’m really proud of how it turned out, considering that I did the one baking method that I’m throwing super shade at right now: baking bread on a sheet pan. I just really wanted to make a long, braided loaf of challah like the ones I see in cookbooks and magazines and using the sheet pan was the only way it would work. This required me to let the dough rise for a much MUCH longer time than the recipe called for…like an extra hour longer. On both the first and second rise. Yeah, I was determined that this stuff was going to work out. The sheet pan would NOT beat me this time. And I really don’t think that it did- the look, taste and texture of this bread is proof of that. Another plus to this was that I was left with an empty vanilla bean that I remembered Ina Garten giving me a useful tip with which to use it for. I filled a medium sized jar with sugar and placed the vanilla bean inside of it. Two days later, I opened the jar and smelled with a smile: I know have about 2 cups of Vanilla Sugar to plan a recipe around. Win. 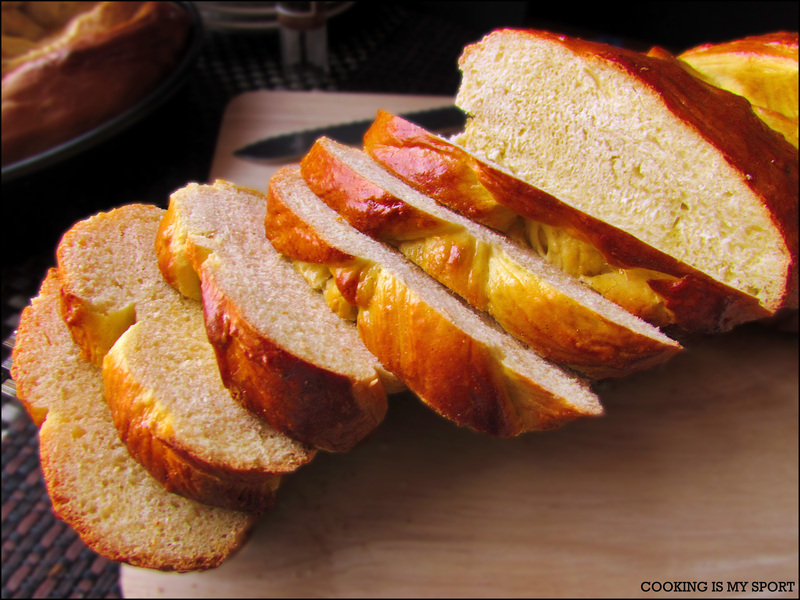 Stay tuned for tomorrow’s last recipe in our Challah Series. 1. In a large bowl, proof your yeast by whisking with 1 teaspoon of sugar in 1 cup of lukewarm water. Set aside and let sit until the yeast starts to foam. Once it has foamed, pour into the base of an electric mixer and used the whisk attachment to mix in the olive oil, the two eggs (one at a time), sugar, and salt. 2. Split the vanilla bean and scrape all the seed into the mixer. Switch to the dough hook and slowly add the flour, one cup at a time until it comes together and pulls away from the sides. Allow to knead in the mixer until smooth. (About 5 minutes.) If the dough seems too wet, add a little more flour, ¼ cup at a time. 3. Turn out the dough onto a floured surface and roll into a ball. Grease a large bowl well with olive oil and place the dough ball in. Turn once to cover the top and cover with plastic wrap. 4. Place in a warm place to rise for an hour or until doubled in size. (I use my turned-off oven as the heat from the pilot light is perfect temperature.) Use your fingers to gently poke the air out of the dough, roll back into a ball, grease, cover and let rise again for another 30-45 minutes. 5. Once the dough has finished the second rise, roll out onto a floured surface and gently knead into a smooth ball. Cut into six equal size balls and roll each one into a tapered snake shape, about 10 inches long each. Arrange the six rolls next to each other in a row and pinch the ends together. To braid, start from the right and go over two, under one, and over two. Tuck in closer and repeat again with the right-most piece of dough repeating until the entire loaf is braided. Set on a baking sheet lined with parchment paper. 6. Beat the last egg and use a pasty brush to lightly brush over the loaf. Let rise for another hour. 7. When you are ready to bake, preheat your oven to 375 degrees (if you are rising the dough in the oven please be sure to remove it first). 8. Once the oven is ready, brush the loaf again with egg wash and place in the oven to bake for 30-40 minutes or until the top is glossy and golden brown. 9. Cool on a rack and serve. Beautiful Challah Jess! You’ve become an expert at the braiding technique. I bet this sweetened version with vanilla is superb. I would love to take thick slices of this and spend my Easter morning indulging in a glorious French toast! You really should link this up to Fiesta Friday and share it with the masses! Just a thought…. Thanks Nancy; trust me if, you saw my first attempt at the braiding technique, you would appreciate just how far I’ve come with this lol This time around, I was smarter and just re-watched a how-to Youtube video and after that it was easy. 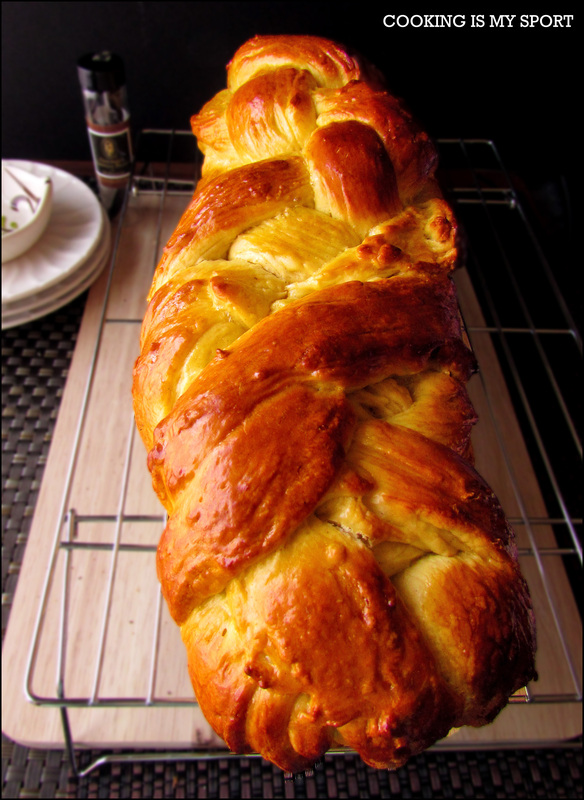 Jess… You should be proud of this vanilla bean challah… I am so impressed with this… With you… This post was so eloquently written… I truly enjoyed every word… And completely agree with everything that cannot be improved upon…. This sounds delicious! Love the vanilla! Thanks for the compliment 🙂 I used to be scared of it too Heather, but it’s really one of the easier yeast breads I’ve made- the braiding is the most difficult part, and I just watched a couple of tutorials on that, and then it was pretty easy. I hope you do decide to try it! What an amazing idea! 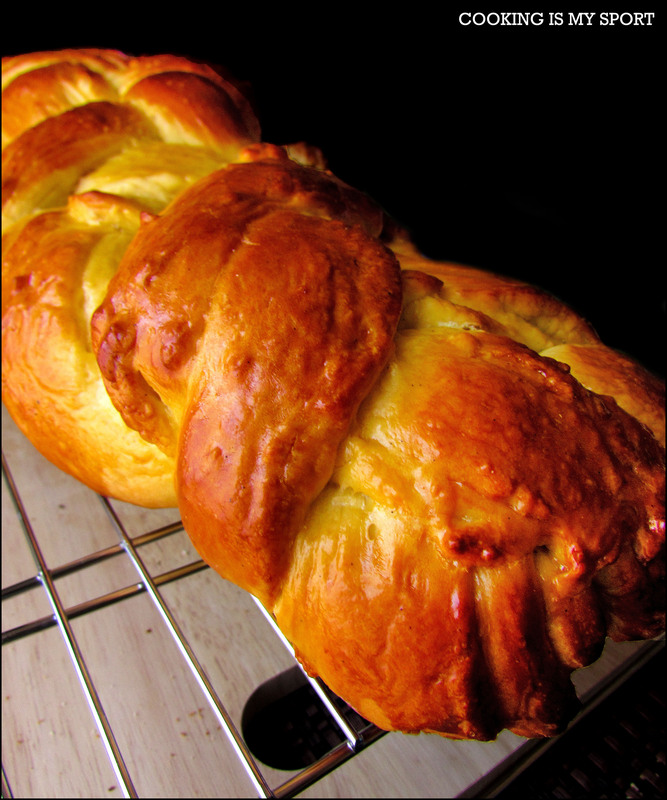 I love challah… now it is kicked up a notch! GORGEOUS!! I am making this ASAP 🙂 I hope mine is as lovely as yours!